Shop downtown! You&apos;ll enjoy every personalized minute of it! 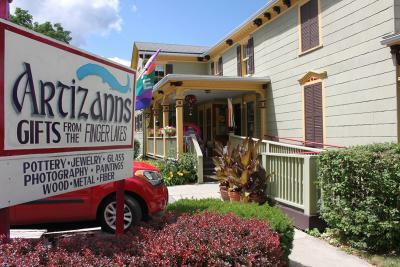 Beautiful arts and crafts, jewelry, household items, memorabilia, and handmade products, and souvenirs are just a few of the unique things you’ll find in shopping at local downtown merchants throughout the Finger Lakes. In historic downtown Canandaigua, for example, you&apos;ll find shopping in one-of-a-kind niche boutiques, shops, and stores that have as much personality as the shop owners themselves. Need a chocolate pick-me-up? Sweet Expressions, headquarters for homemade chocolate treats, is a must. Each and every downtown community has its own shopping character. Naples is for the artsy shopper. 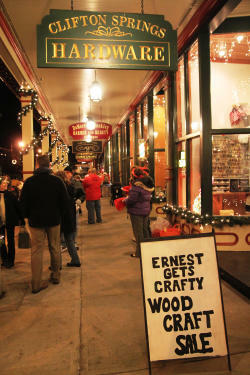 In Victor, you&apos;ll find delightful jewelry and clothing shops in the downtown area. There is musical accompaniment along the historic Peirce Block of Clifton Springs, where you can browse for gifts, books, housewares, and antiques. Look for sportswear, knitting supplies, antiques, furniture, gourmet foods, and more in Geneva. Shopping with our local merchants is yet another reason to visit the Finger Lakes for those unique and one-of-a-kind gifts for your special loved ones.